With a rated operating capacity of 3,400 lbs. 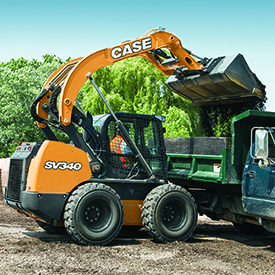 and bucket breakout force of 9,531 lbs., the SV340 is CASE’s most powerful skid steer. Ideal for demanding, high productivity attachments, the SV340 offers optional high-flow (38.7 gpm at 3,450 psi) and enhanced high-flow (35 gpm at 4,000 psi) auxiliary hydraulics. Heavy-duty 14 x 17.5 tires, additional counterweights and a long wheelbase provides stable operation. The SV340 offers one of the widest cabs in the industry and the lowest entry threshold for easy access and greater visibility down to the bucket. The cab-forward design, large rear window, and ultra-narrow wire side screens provide best-in-class 360-degree visibility.